Beautiful remodel! BRAND NEW KITCHEN! With 6 BEDROOMS, 6.5 BATHS for total of 5 KING MASTER SUITES plus a bunk room with a 2 sets of bunk beds (one full-over-full bunk and and one twin bunk). New living room furniture with kids area, and amazing expanded pool deck area. Comes with FREE eye-catching 57 Chevy style golf cart with a rumble seat, seating up to 6 people. Has a stereo built-into the dash and 2-tone stitched faux leather seating ($750 security deposit required to use golf cart). Perfect home for 3-5 families with kids. Perfect home for 5-6 couples, each having their very own private bath. Perfect home for adults only groups of up to 14 max. There is plenty of room for everyone to enjoy this beautifully updated home. The thoughtful layout and amenities in this home make it the most comfortable and functional vacation home you are going to find for your family. A private backyard pool is all yours to enjoy with lots of seating, umbrellas, and a natural gas grill - and there’s a separate Guest House Cottage that offers extra convenience and privacy with TWO brand new King Master Bedrooms, each with attached private baths. The super fun 3rd Floor Crow’s Nest provides panoramic views of the ocean and Destin’s amazing Crystal Beach neighborhood. And when you’re ready to enjoy the white sand beaches - it’s only a little over a block to the nearest public beach access! The beautiful screened front porch welcomes you into this exceptional home. Inside, you’ll find a bright and beautiful living area with gleaming tile floors, windows all around and plenty of seating for your entire group. Enjoy your meals together at the large dining table - seats up to 10 - with room for 2 more at the adjacent kitchen bar. The inviting open spaces continue in the BRAND NEW CUSTOM KITCHEN - it’s a perfect layout for multiple cooks with plenty of space to spread out. You can be one of the first to enjoy the gorgeous 42" cabinets, granite counters and brand new stainless steel appliances. There’s a spacious pantry, wet bar and an additional under-counter icemaker, and custom wine storage – perfect for entertaining! You’ll find all the dishes, pans and utensils you may need, a Keurig D-Cup coffee maker, as well as a regular drip coffee maker, a toaster, a blender, and even a few spices, to get you started. For the convenience of our guests, we have included a high capacity Samsung HE washer and dryer in the laundry area, and you’ll also find an iron, ironing board, broom, and a few cleaning supplies. We keep our home clean and well updated, and pay attention to amenities you expect, such as high-speed internet, nice flat-screen TVs, high-definition cable, hair dryers in each bathroom, and more. We also provide items our smaller guests may need like a high chair and pack-n-play. This beautiful master bedroom on the 1st floor features a KING BED and private access to the front porch. There’s an armoire and closet for convenient storage, as well as a nightstand, lamp, and a flat screen TV. You’ll also appreciate the attached private bathroom. This well-appointed bathroom features a single sink with storage beneath, a commode and a tub/shower combination. You’ll also find big, fluffy bath towels and a personal hair dryer. Convenient for everyone, this half bath on the 1st floor includes a beautiful pedestal sink and a commode. This huge master bedroom features a KING BED, full-size dresser, two nightstands with lamps, and a large closet. It’s been freshly painted and features a beautiful new quilt and décor. This is a welcoming retreat, with private access to the balcony where you can sit and enjoy some quiet time or maybe a game of cards at the table. There’s a flat-screen HDTV so you can watch your choice of programs, and an expansive attached private bathroom. This roomy bathroom features an extra-large vanity with double sinks and drawers, commode, a large soaker tub and separate shower. This inviting king master bedroom features a KING BED with a beautiful cotton quilt and a flat panel TV. From this room, you can step out to the second floor balcony to enjoy your morning coffee or relax after a day at the beach. There are two large bedside tables with reading lamps, if you’d like to curl up with a good book. You’ll also appreciate the private ensuite bathroom. This well-appointed bathroom features a single sink with storage beneath, a commode and a tub/shower combination. When the children are ready to wind down - they will love being together in this fun room. There is one set of twin bunks and one set of full bunks (2 twins and 2 full beds), a nightstand, closet and a flat panel TV. They even have a dedicated bathroom next door. This full bathroom offers bunk room guests a single sink with storage beneath, a commode and a stand-up shower. Everyone will want to spend some time in the 3rd Floor Crow’s Nest and on the balconies that surround it! You’ll experience panoramic views of the ocean and the entire Crystal Beach area -- simply beautiful! Relax on the balcony and enjoy sunrise and sunset, or hang out inside where you’ll find a high table and chairs - a great place to play games and enjoy the view. There’s also a futon up here for lounging during the day - or sleeping at night - It’s a popular place, you may have to take turns! This lovely Carriage House is next to the private pool behind the main house. Inside, you’ll find TWO BRAND NEW KING MASTER SUITES with PRIVATE FULL BATHROOMS. There’s a door in the hallway between the two King Suites. This bright, beautiful bedroom features a comfortable KING BED with custom headboard, new quilt and décor. Two bedside tables with reading lamps make it a comfortable space to relax – there’s also a flat screen TV. With the dresser and closet, you can unpack and make yourself at home. Double doors take you out to the expanded deck and inviting pool area. Relax and enjoy your private space - complete with attached full bathroom. This brand new bathroom includes a commode, sink and brand new shower. New paint, fixtures and décor, a personal hair dryer and big fluffy bath towels complete this fresh new space. This lovely new bedroom features a brand new KING BED with custom headboard, new quilt and décor, as well as 2 bedside tables, reading lamps and flat screen TV. There’s also a dresser and closet, so make yourself at home and unpack your things. When you’re ready to enjoy the expanded deck and beautiful pool, just step through your private double doors. This brand new bathroom includes a commode, sink and beautiful new tile shower. New paint, fixtures and décor, a personal hair dryer and big fluffy bath towels complete this fresh new space. The 12’ x 24’ private pool is surrounded by beautiful decking and landscaping and offers plenty of space to enjoy the Destin sunshine. You can relax in the lounge chairs or at the two tables with chairs and umbrellas for a little shade. For outdoor cooking, you’ll find a natural gas grill. And for your children’s safety, there are alarms on the doors leading to the pool from the main house and the carriage house. Pool heat is available for an additional fee. Crystal Mark is only a block from Shirah Street public beach access! We provide a cart with beach chairs and umbrella, so you can roll your gear to the beach with ease. 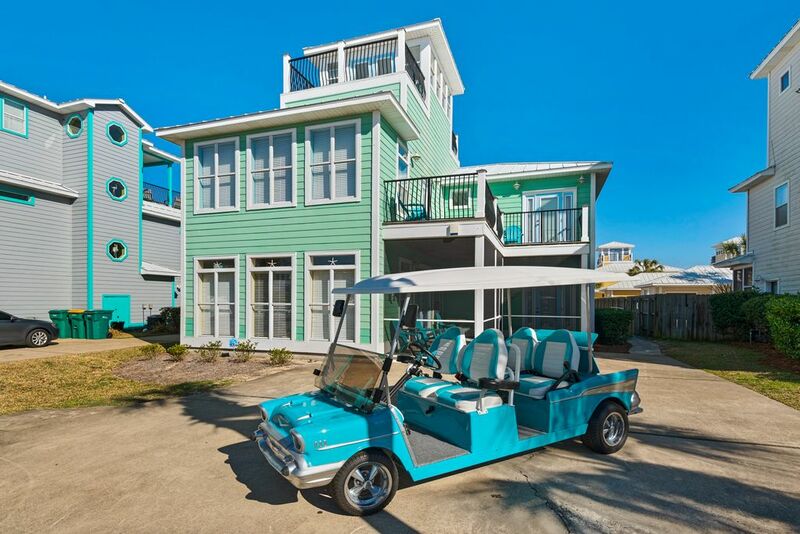 You can also take the golf cart to The Crab Shack, where you’ll find two beach chairs and an umbrella reserved just for you each day of your stay (included with your rental March 1-Oct. 31). There’s a nice driveway in front of the home which accommodates 3-5 cars (depending on size). There is no on-street parking in Destin. We know 'by owner' vacation rentals better than anyone, having been part of VRBO since its earliest days. We own and manage a number of homes in Crystal Beach. These are high-end, very well maintained luxury homes, not 'just rentals.' We live in Destin and greet all our guests, and strive to be proud of these homes. Crystal Beach is lower density than many of Destin, with no high-rise condos on the beach. Sidewalks on every street with white picket fences, yet just across the street from Destin Commons and all kinds of shopping, restaurants, and entertainment. Close to the beach, playgrounds, restaurants, shopping, golf, and lots of other entertainment! Great for multiple or large families with kids. FIVE king master suites! SEVEN bathrooms! One of the most popular floor plans in Crystal beach, private pool, separate carriage house, very close to the beach. This home is undergoing a makeover - all new paint inside and out, new flooring, etc. Book now before we raise our rates! Local calls and 911 only. High-speed broadband internet access included. New stainless-steel Samsung Brand new under-counter ice maker in Kitchen. Keurig K-Cup and traditional coffee makers provided. Large, well-stocked, very functional kitchen with an island. Nice private pool in back yard; Pool heat is available for an extra fee. Crystal Beach is the best! Sidewalks and white picket fences, lower density than most resorts. Destin Commons is right across the street, plus all kinds of other shopping and entertainment and every kind of restaurant all around.